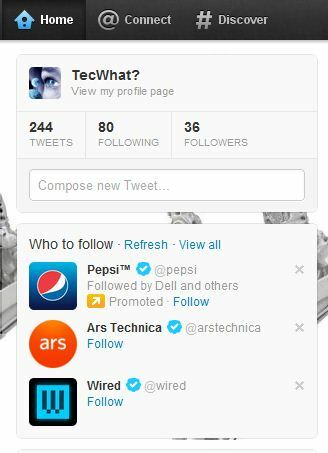 The New Face of Twitter | TecWhat? I must say I love Twitter. I have a few accounts, personal, professional, and of course, our @TecWhat account, which I hope you are following. I use is daily to connect with friends and family as well as promoting TecWhat. I follow the best people I know on Twitter and have made some really great friends. You can often say just what you need in 140 characters. In the past year, Twitter has been doing a lot of re-vamping of their site including better integration of photos. Some of their upgrades have been a little disappointing and alarming for its users, but all that has changed. Today, Twitter released a totally new layout for both the web and mobile phones. The new look and feel is quite different from what we’re all use to seeing, but in moments you should feel right at home. So what’s changed? Just about everything, from the logon to the menu to the way you navigate the site. The design looks cleaner and more thought out, placing everything in framed sections that allow for better and easier viewing. It’s almost as if Steve Jobs had a hand in the renovation. The @Connect page is a little different too giving you the options to easily choose Interactions or Mentions right at the top. The #Discover page gives you Stories and Activity. Both give you Who to Follow and Trends. Viewing you own profile is better too. It’s a clean feel unlike the busy page of Facebook. This is more Google+ inspired, Web2.0. Information is readily and easily available in menus that right there instead of the clunky underlined links of past versions. Basically, the only thing that hasn’t changed is the Settings page. It remains the same, useful and functional. If you aren’t using Twitter or you’ve left for any reason, go have a look-see at the new design. Twitter is working hard to give you the best experience possible and they’re getting really close to it. If you’re already there, then enjoy the new design and let me know what you think!